Bringing you all the beauty of a grand piano but packed with incredible technology, the Yamaha CLP-665GP Clavinova Digital Piano delivers a sublime playing experience and adds features such as Bluetooth, USB and MIDI connectivity, acoustic optimisation and a rich collection of effects to further enhance the already pristine sound engine. 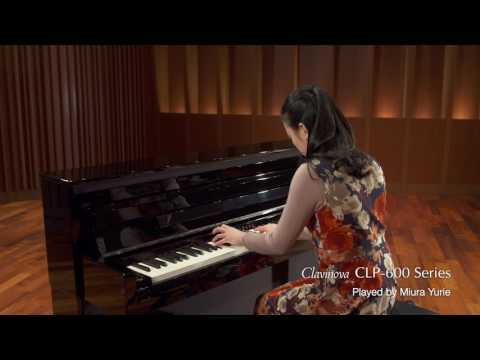 The Yamaha CLP-665GP Digital Piano takes its core samples from the CFX, Yamaha’s finest concert grand selected and played by the winner of the 2010 International Chopin Piano Competition and the Imperial from Bösendorfer, a brand held in high esteem by pianists throughout its long history. With the Yamaha CLP-665GP Digital Piano you can be sure of the most authentic, fundamental piano sound from Yamaha to date. The Yamaha CLP-665GP Digital Piano not only employs the samples from the worlds best Grand Pianos, but also has a custom-designed sound system to recreate string-resonance and the natural reverberation that occurs when strings react to one another. In addition to the reverberation of the strings, damper resonance reproduces the broad, deep sound field of an acoustic piano. It also portrays the tonal changes that result when a damper pedal on a grand piano is depressed. It includes sounds such as those emitted from the key bed and emulates the cumulative resonance that occurs when all of these sounds blend together. The end result is almost indistinguishable from playing a premium acoustic grand. To have this level of sound quality would be rendered powerless without an equally authentic playing experience and the Yamaha CLP-665GP Digital Piano employs Yamaha's own Graded Hammer 3X keyboard with escapement. The mechanism itself is extremely similar to the keyboard that can be found on a grand piano. There are no springs to wear down over time, and it also utilises a a three-sensor configuration that accurately senses and interprets the behaviour of the keyboard to create a response and feel very much like that of a grand piano. Finally, the synthetic Ivory keytops reproduce the exact, highly-absorbent properties of a grand piano which will prevent fingers from slipping after hours of performance. As well as the obvious fact that you will never have to tune the Yamaha CLP-565GP Clavinova Digital Piano, there are many benefits of owning a digital piano. You will find 34 premium-quality voices built into the Yamaha CLP-565GP, rich electric pianos, lush strings, choppy organs and more that will truly maximise your performance. The Yamaha CLP-565GP Clavinova Digital Piano comes with an array of built in effects, duplicating warm rooms, spacious halls and lively stages. The built in acoustic optimiser compliments this delivering a spaciously vast and natural sound from the powerful speaker box. Finally, the Yamaha CLP-565GP Clavinova Digital Piano has the ability to record and play back both MIDI data and audio (.WAV) files from USB. Record and playback your own masterpieces on other supporting CLP devices. The CLP-665GP also has built in bluetooth connectivity for use with your iPhone, iPad, iPod Touch or Android devices along with the suite of Yamaha apps. The Yamaha CLP-565GP Clavinova Digital Piano even has built in songs to demonstrate the power of this remarkable instrument as well as over 300 lessons to help improve your playing, no-matter what your level of skill.